Abbey Ibrahim (Class of 2018) and Chris Pommier (Class of 2018) with the Honorable James O. Browning, U.S. District Judge, who generously helped prepare the team for competition. 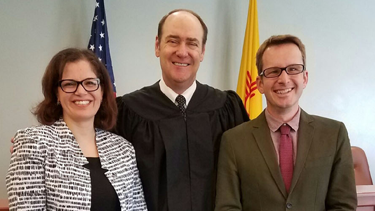 The UNM School of Law Intellectual Property Moot Court team recently competed in a regional competition in the AIPLA Giles Sutherland Rich Moot Court Competition. Class of 2018 students Abbey Ibrahim and Chris Pommier argued a question of patent law and a breach of contract claim against the Berkeley team – and the Berkeley team ultimately won the competition. Baum says that the practice round judges were invaluable to the team’s preparation. “Judge Browning, Professors Occhialino and Bach, and IP practitioners/alums David Ferrance, Justin Muehlmeyer, Gina Constant, and Svitlana Anderson were incredibly generous with their time to guide the team,” she adds. Both Ibrahim and Pommier suggest taking part in a moot court competition during law school and recommend it highly for anyone considering appellate litigation. They are also very grateful for their coach. “Thanks to our amazing coach, Professor Baum, for her support and valuable feedback throughout the whole process and for lining up the best panels to moot us,” says Ibrahim. Ibrahim and Pommier spent two months drafting a brief in response to a problem created just for the competition. After spending many hours researching, drafting, and editing the brief, they then spent two nights a week throughout February and most of March running through practice after practice of their oral argument. The preparation was grueling at times, but served them well as they competed in Palo Alto. The AIPLA Giles Sutherland Rich Moot Court Competition—named for one of the most distinguished jurists in the field of patent law—celebrated its 44th year in 2017.